The HKPNETs Forum - www.hkpnetsforum.com With 400+ PNET members it's the place to be!! Resources, links and ideas for PNETs in Hong Kong. To share your favourite links or resources send an email to or attach them to a post in The HKPNETs Forum - Resources. *** The EDB NET Admin Team has confirmed that the following documents are "applicable to 2018/19 school year" i.e. 2018-20 contracts. 1. EDB Circular "NET Scheme in Primary Schools Letter of Appointment"
- Outlines basic arrangements for preparing a NET contract and a form that schools must send to the EDB with details of the contract offered. - The 2013 circular remains in force as it has not been updated since. - Up until 2013, this document used to be updated, reissued and sent to schools every year. - From 2014, schools are expected to retrieve this and all other contract documents from the EDB website for themselves. 2a. "Specimen Letter Offering Appointment"
- Template for schools to use detailing contract period, visa requirements, length of contract etc. - Should have the memo and acceptance letter detailed below attached to it. - Makes reference to the "Prevention of Bribery Ordinance Circular (EDBC03014E)". (applicable to 2018/19 school year)"
- The major contract document that sets our terms and conditions on offer. - In August 2016 the document was updated to reflect an adjustment to the rate of Special Allowance, but retained the same filename. A version reference was also included at the bottom of every page (as agreed during liaison with the HKPNETs Forum). 2013: "2.4 All NETs should, before appointment, fulfil [sic] all the appointment requirements for the NET posts in primary school"
2014: "2.4 All NETs should, before appointment, fulfil [sic] all the appointment requirements for the NET posts in primary schools as stipulated in the prevailing Circulars, Circular Memoranda, letters and guidelines issued by the Education Bureau (EDB)." 2015: "1.3 For the purposes of the Contract: (a) Contract Period means the Appointment Contract Period, as extended by each Extension Contract Period (if applicable); and (b) Extension Contract Period means each period by which the Contract Period is extended in accordance with paragraph 21.3. 2016 May to August: "1.3 For the purposes of the Contract: (a) Contract Period means the Appointment Contract Period, as extended by each Extension Contract Period (if applicable); and (b) Extension Contract Period means each period by which the Contract Period is extended in accordance with paragraph 21.3. - Template for schools to use to gain an employee's agreement to the contract on offer. - Makes reference to the "Education Ordinance" and "Code of Aid". of contract [Total Wastage] out of the total number of NETs completing contracts in that particular school year. the EDB candidate pool or from direct hire by schools. 2006/7 ? (460+?) ? ? 431 ? ? HKPNETs Forum Liaison with the EDB. In Jun-Aug, the EDB considers the % difference figure alongside attrition rates and affordability to the Government to determine what, if any, adjustment should be made to the SA. In early Aug, Any adjustment to the SA rate together with how it is to be implemented is announced to schools via an EDB Circular Memorandum published on the EDB website and via an equivalent update to the 'NET Scheme - Remuneration Package' website. Full details of the history of changes to the rate of Special Allowance is available in the Special Allowance History of Reviews Information Sheet. Up until 2013, any change in the SA rate was announced by the EDB to all schools via a direct Circular Memorandum in June, with the SA review decision also being reported during a meeting with Nesta also in June. Since 2014, the decision is announced by the EDB to all schools via an EDB Circular Memorandum published on the EDB website and via an equivalent update to the 'NET Scheme - Remuneration Package' website. Following discussions with The HKPNETs Forum, the EDB kindly informs The HKPNETs Forum and Nesta via email of the publication of Circular Memorandums. Any adjustment to the rate of Special Allowance is only applied to newly-singed contracts and to those extending their contract. Mid-contract NETs remain on the existing rate stated in their contract until signing a new/renewed contract in the following year. The EDB has occasionally in the past decided to apply the adjustment to all NETs due to "special circumstances" but the de facto position is that EDB is mandated to follow the LegCo approved contract-based adjustment mechanism. The NET may be eligible for a monthly allowance of HK$nn,nnn which is fixed over the Contract period. The rate of the allowance is subject to adjustment according to the prevailing rate upon the NET entering into further employment under the Scheme. In 2005, a policy clarification stated that this approach "was intended to provide certainty to NETs so that they know the level of Special Allowance throughout their entire two-year contract" due to an ongoing "declining trend" in rental values from 1997-2005. This approach was understood and considered sensible by Nesta. In 2014, the EDB stated that the EDB is obliged to follow the established LegCo approved mechanism" and reiterated that the implementation approach provides certainty to those NETs in the middle of their contract given that the SA is subject to both upward and downward adjustment. In exceptional, unique circumstances it may exercise discretion to provide a more favourable benefit than that stated in the contract after due consideration of the individual merits of each unique situation. Nesta first petitioned for the SA Mechanism to be upheld and then petitioned for adjustments to apply to all eligible NETs employed under the EDB's Enhanced NET Scheme irrespective of contract renewal date. Lee Weston and other NETs on extension contracts petitioned for adjustments to be made to new contract extensions in line with the legal status of previously and newly signed contract agreements. Since 2015, a further policy clarification has been included in the standard letter of appointment. (b) upon the commencement of the Extension Contract Period. The rate of change of rental prices determines the frequency of adjustment of the rate of SA. The SA Mechanism compares current rental values to the previous time the SA was changed. Whether a change in SA rate occurs in even or odd years therefore depends on the speed with which rental values are increasing or decreasing. Given a standard increasing/decreasing rate of change in rents, over the first year following a change in SA rate it is unlikely that a 10% change in rental values will occur. Over a two-year period it is more likely, and over a three year period it is even more likely etc. The history of changes shows that the SA rate changed in 2004, 2005, 2008, 2009, 2011 and 2014 - a mixture of even and odd years. Taking the example of "odd-year" contracts, for the 2004/5 adjustment from $13,000 to $10,500, those NETs renewing contracts in 2005 ("Odd-year NETs") benefited to the amount of +$2,500 per month for one year by not receiving the decrease NETs renewing in 2004 received. For the 2014/5 adjustment from $16859 to $19081, those NETs renewing contracts in 2015 (the same Odd-year NETs) lost out to the amount of -$2,222 per month for one year by not receiving the increase those NETs renewing in 2014 received. Cumulatively, therefore, Odd-year NETs incurred a total loss of -$278 per month for one-year, the equivalent of -$3,336 in total over an eleven year period. Details of the definition of the Special Allowance are available in the Special Allowance Information Sheet. A fixed rate Special Allowance (SA) was proposed by the EDB and authorised by the LegCo Finance Committee on 12 Nov 1997 at the commencement of the NET Scheme in secondary schools. (c) apply the above new Special Allowance rate to serving NETs when their contracts are renewed, and to any newly recruited NETs starting from the 2004/05 school year. The rate is to be adjusted annually, but the same rate will hold for the duration of the contract period of two years for any particular NET. Monitor rental movements in conjunction with the attrition rates, and adjust the special allowance when that situation has changed significantly, say when the fresh-letting rental prices change by 10% or more, taking into account the rental expenditure pattern, the type and location of accommodation of typical NETs, average fresh-letting rental prices, the attrition rate and the affordability of the Government. (b) the relevant territory-wide average fresh-letting rental prices from the "Private Domestic - average rents by Class" surveyed by the Rating and Valuation Department. The average rental prices since the last SA adjustment in 2007 would be used as the base line for the next SA review. In summary, if the average change in rental prices compared to the last base year shows a 10% increase, a SA review is triggered during which the EDB considers that average increase alongside attrition rates and affordability to determine the final adjustment. The EDB-calculated change-in-rental-prices data calculation used in this process are not made public, however simulated calculations can be viewed here. The EDB has confirmed (by email, 2 Apr 2015) that the source data is the '1. Private Domestic - average rents by Class' spreadsheet published on the Rating and Valuation Department website. This data only becomes available in mid-May, 5 months after the end of the calendar year, at which point the SA Adjustment Mechanism review commences. The SA review is always retrospective, whilst any associated SA adjustment is applied in the following year i.e. the 2015 SA review takes place in mid 2015 using 2014 data, with any SA rate change being applied in the next contract cycle 2015/17 starting in Aug 2015. 1. In May/June/July 2005, three representations (1, 2, 3) were made by the Nesta Special Allowance and Gratuity Committee to LegCo proposing that the adjustment mechanism "should not be based solely on the CPI, but should take into account the actual expenses that expatriates in HK face, including the rental index for non-owners and education fees with further consideration of the recent tax increase in assessable income, school fees (ESF, private international schools), medical insurance, work/living conditions, family/children extra-curricular activities fees (school bus; compulsory swimming lessons, art materials, school camps, computer textbooks, library sponsorship and class trips; sporting, recreational and entertainment fees), and increase in Helpers' salaries (necessity for many NETs, NETWiKs have to employ helpers in order to be free to perform their duties)". The proposal also included an increased gratuity of 25% and a 5-year long service payment. 2. This new baseline was "agreed with Nesta"
2016/17 Increased to 20,989 = +10% On renewal of contract as the SA rate is fixed over the contract period. 2014/15 Increased to 19,081 = +13% On renewal of contract as the SA rate is fixed over the contract period. 2011/12 Increased to 16,859 = +18% Applied to all NETs due to the previous freeze. 2009/10 Frozen at 14,245 = +0% Increases in rental prices not applied due to the global economic downturn since mid-2008. 2008/09 Increased to 14,245 = +10% Applied to all NETs due to a capped rather than a full increase. 2005/06 Increased to 12,950 = +23% Applied retrospectively to the beginning of 2005/6 school year (SA review finalised in Nov 2005) to all NETs on compassionate grounds and to have the earliest retention effect on serving NETs. 2004/05 Decreased from 13,000 to 10,500 = -19% On renewal of contract so as to provide certainty to NETs so that they know the level of Special Allowance throughout their entire two-year contract. The 2019/20 SA Mechanism figure was calculated by the HKPNETs Forum to be +7.94%. Confirmation is awaited from the EDB that the SA Mechanism figure does not meet the 10% trigger for an rate adjustment. Nesta made no recorded suggestion. The 2018/19 SA Mechanism figure was calculated by the HKPNETs Forum to be +2.65%. The EDB confirmed that the SA Mechanism figure of +2.65% did not meet the 10% trigger for an rate adjustment. Nesta made no recorded suggestion. The 2017/18 SA Mechanism figure was calculated by the HKPNETs Forum to be -6.18%. The EDB confirmed that the SA Mechanism figure of -6.18% did not meet the 10% trigger for an rate adjustment. Nesta made no recorded suggestion. The 2016/17 SA Mechanism figure was calculated by the HKPNETs Forum to be 16.44%. The EDB confirmed the figure to be ~16%, but awarded a capped increase due to stable attrition rates. Nesta made no recorded suggestion, but asked NETs to petition the EDB to "be paid the same Special Allowance as they used to be". The 2015/16 SA Mechanism figure was calculated by the HKPNETs Forum to be 6.85%. The EDB confirmed that the SA Mechanism figure of 6.85% did not meet the 10% trigger for an rate adjustment. Nesta made no recorded suggestion. The 2014/15 increase was in line with the 13.18% SA Mechanism figure. The HKPNETs Forum confirmed 13.18%. Nesta suggested the figure was 7.8% but petitioned for 27% stating the existing SA was 21% lower than the average rental price. The EDB disregarded the petition and awarded a 13% increase in line with the SA Mechanism. The 2013/14 SA Mechanism figure was not made public. The HKPNETs Forum retrospectively calculated 7.75%. The 2012/13 SA Mechanism figure was not made public. The HKPNETs Forum retrospectively calculated 7.36%. The 2011/12 SA Mechanism figure was not made public when the 18% increase was applied. The HKPNETs Forum retrospectively calculated 18.35%. The 2010/11 SA Mechanism figure was not made public. The HKPNETs Forum retrospectively calculated -1.38%. The 2009/10 SA Mechanism figure was not made public. Nesta suggested 17-20% but agreed to the 0% freeze determined by the EDB. The HKPNETs Forum retrospectively calculated a SA Mechanism figure of 16.97%. The 2008/9 increase was capped at 10% instead of the full 17.8% SA Mechanism figure due to "poor prevailing economic conditions". Nesta asked the EDB for 45%, publicly asked for 39% in the SCMP, submitted a petition for up to 31%, but agreed to 10%. The 2005/6 increase resulted from a change in the adjustment mechanism to use the prevailing rental prices in 2005. The SA Mechanism figure was not made public. Nesta asked the EDB for 43%, but supported the EDB's proposal based upon the Mechanism figure. 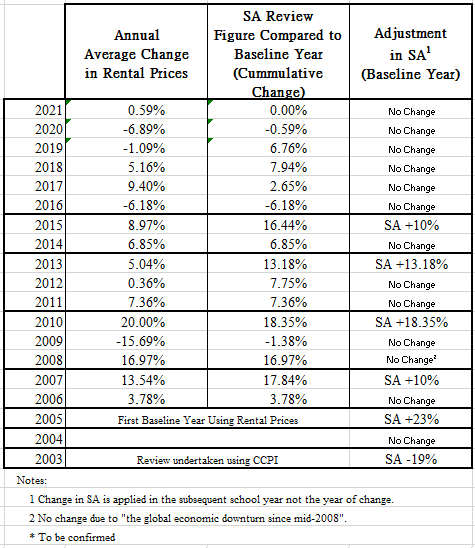 The 2004/5 decrease resulted from the introduction of the SA adjustment mechanism in Nov 2003 linking SA to movements in the rental component of the Composite Consumer Price Index which reflected the ongoing declining trend in rental prices.